New Published Letter, a response to the ‘number needed to suffer’. The new issue of Acta Paediatrica (Februray 2018) includes a letter I wrote in response to a commentary written by a paediatric anaesthetist, Dr Lönnqvist. A number of papers explore the outcomes of extremely preterm infants. Gillone et al state that the one-year survival rate for babies born at less than 501 grams in the North of England was only 22% in 1998-2012. Lynoe et al ask what the indications should be for providing extremely preterm infants with neonatal intensive care and Lönnqvist proposes that disability-free survival and the number needed to suffer should be used as outcome measures for such care. He claims that it is misleading to just focus on saving lives, without paying attention to the risk of severe disabilities, poor quality of life and the suffering of families. Helgesson agrees with Lönnqvist, while Barrington strongly disagrees. That brief description mischaracterizes the points that I made. Dr Lönnqvist wrote his ‘A Different View’ claiming that disability-free survival was a new concept that should be used as the primary focus on decision making for extremely preterm infants. That, of course, is ridiculous, as I noted in my letter, disability-free survival has been an unfortunate focus of neonatal outcome studies for decades; I say unfortunate because calculation of such an index conflates death and ‘disability’. The point I made is that both death and disability are important, but they should be considered separately, not lumped together as if they had equivalent impact, or were treated and valued the same by families. Of course, as you will know if you are a frequent reader of this blog, so-called ‘disability’, as included in most long term outcome studies, usually means low scores on developmental screening tests, and not the presence of a disabling condition. To emphasize a point I have made many times, “NDI”, which stands for Neuro-Developmental Impairment, is an abusive misnomer. Most babies who are thus labelled are listed as being impaired because of lower scores on developmental screening tests, like the Bayley Scales of Infant Development. But a Bayley version 2 MDI score under 70 (or a Bayley 3 language or cognitive composite under 85, or indeed a score on any standardized developmental screening test below an arbitrary cutoff) is not an impairment. An impairment is “a loss or abnormality of psychological, physiological or anatomical structure or function”; infants with a developmental test score below a particular threshold do not, by this definition, have an impairment. If their developmental difficulties affect their function, then they may have an impairment, but most babies with lower screening scores have no functional ‘abnormality’, and are not impaired. Dr Lönnqvist’s calculation of the ‘number needed to suffer’ requires that he conflates impairment with suffering. His idea that a day of living with an impairment is equivalent to a day of suffering is completely unacceptable. His calculations of ‘number needed to suffer’ require that infants who die before they leave the NICU have the sum of their ‘days of suffering’ calculated. This is then added to the number of days of life of children at follow-up who have impairments to calculate the denominator of suffering. According to his calculations, the numerator is the number of babies who survive without impairment. Again, according to this nonsensical metric, as the children get older the ‘number needed to suffer’ increases each day, because, according to this calculation, having an impairment means daily suffering. At 3.5 years, he calculates a number needed to suffer of 1/1369, at 10 years, if we counted minutes rather than days, the NNS would be in the billions! As I point out in my letter, an issue to which Dr Lönnqvist does not respond in his answer (also published on-line simultaneously), if we follow his reasoning, any surgery for a child who is already blind or has cerebral palsy would be unconscionable, their ‘disability free survival’ would be zero and their ‘number needed to suffer’ would be infinite. Despite the prejudices of Dr Lönnqvist and others of like mind, most extremely preterm babies who survive do so without serious impairment, even those who really do have serious impairments have a good quality of life, and there is little impact of gestational age at birth on the frequency of impairment. 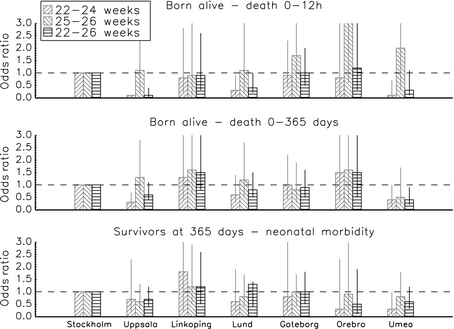 In his reply to my letter, Dr Lönnqvist suggests that babies in the south of Sweden born at 24 weeks gestation have better outcomes than babies in the North, and that this is because of the vacuuming up of resources by the 22 weekers, who are much more likely to receive active care in the North than in the South. This is, of course, nonsense. Admitting one of the 3 or 4 babies of 22 or 23 weeks gestation each year in an NICU has no perceptible impact on resource utilisation overall for an NICU (there were about 50 deliveries at 22 weeks over a 3 year period, they were admitted to one of 7 NICUs). There is no reasonable way you could calculate the impact of such an admission. The data presented by Dr Lönnqvist are neither peer-reviewed nor are they adjusted for baseline risks, he presents unverifiable data (which incidentally appeared on the front cover of Acta Pediatrica a few years ago) from what he says are Swedish government sources (in the legend to the figure he states that these are from “post-publication data processing” of the EXPRESS cohort) we have no idea if those data include delivery room deaths, how they were collected etc. etc. In fact the numbers in that figure are not the same as any numbers in the original cohort, neither the numbers of fetuses alive at admission of the mother, nor the number of live births. In the original publication prior to the “post-publication data processing” you can see from this figure that the births at 22, 23 and 24 weeks were considered together. You can also see that the centers with the lowest odds of death at 25 to 26 weeks were the centers that also had the lowest odds of death at 22 to 24 weeks, that is Uppsala, Lund, Orebro and Umea. None of which suggests that more mature babies are less likely to receive optimal care if the most immature babies also receive it, quite the opposite. Indeed multiple other data sources also strongly suggest the opposite, if you are active in the care of the most immature babies, you do a better job with the slightly less immature ones. In his reply to my letter Dr Lonnqvist states that data describing the long term outcomes of infants who had surgical NEC are limited, which they are not. There is a substantial literature describing the outcomes of infants with NEC, including the subgroup with surgical NEC; the adverse impacts of this terrible disease are well documented, there are over 40, and maybe as many as 60, articles which address these issues. One of the best recent papers, from last year in the Journal of Pediatric Surgery, shows that if you define serious adverse outcome to include a Bayley version 2 score under 70 at 18 months of age (which I would not, that is not something that is of importance to most families), then the majority (62%) of extremely low birth weight infants (<1000g birth weight) with surgical NEC who survive are free of serious adverse neurological impairment or developmental delay. There are few data, to my knowledge, of even later outcomes of such babies, it would be interesting to know how many babies with surgical NEC have serious functional disability at 5 years of age, for example. That would be much more relevant to most families, I believe. There are data from Calgary about outcomes at 36 months of babies under 1250 g who had NEC, but no analysis of those with surgical as opposed to medical NEC (76% of NEC survivors had no developmental delay or neurologic problem at 36 months in this study). Surgical NEC is indeed a bad disease, with substantial mortality and an increase in neurologic problems and developmental delay among survivors. It is certainly something we should try to avoid, and to treat as appropriately as possible. But most survivors, even the extremely low birth weight, still have good neurological and developmental outcomes. Making blanket decisions to operate or not should not be based on simplistic reductions of risk to gestational age, nor by conflating the risk of death with the risks of developmental delay and other adverse outcomes. We should individualize our decision-making discussions; which means that, for a 23 week gestation infant without other additional risk factors, a decision to perform surgery might be perfectly in line with the parents’ values, and present a reasonable chance of survival and of a good long term outcome: for a 25 week gestation infant who has already had several other risk factors when he perforates at 4 weeks of age, a decision to institute comfort care might be completely reasonable, and consistent with the parents’ values. Decision-making should definitely not be based on nonsensical calculations of “number needed to suffer” which explicitly equate living with a developmental delay with suffering. This entry was posted in Neonatal Research and tagged Ethics, long term outcomes, mortality. Bookmark the permalink.